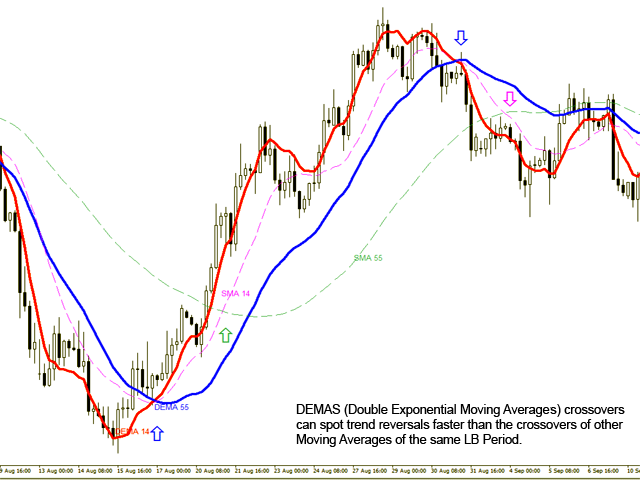 Double Exponential Moving Average (DEMA) is a moving average (MA) that gives the most weight to recent price data.Like exponential moving average (EMA), it is more reactive to all price fluctuations than a simple moving average (SMA) and so DEMA can help traders to spot reversals sooner, because it is faster responding to any changes in market activity. DEMA was developed by Patrick Mulloy in an attempt to reduce the amount of lag time found in traditional MAs. (TASC_Feb. 1994). DEMA can also be used as a component in a lot of indicators like Moving Average Convergence Divergence (MACD) and Triple Exponential Moving Average (TRIX) that are based on MA types and can be modified to use a DEMA instead of other more traditional types of MAs. Select Period for DEMA: It is the number of Bars that we Look Back on the Chart in order to calculate DEMA. 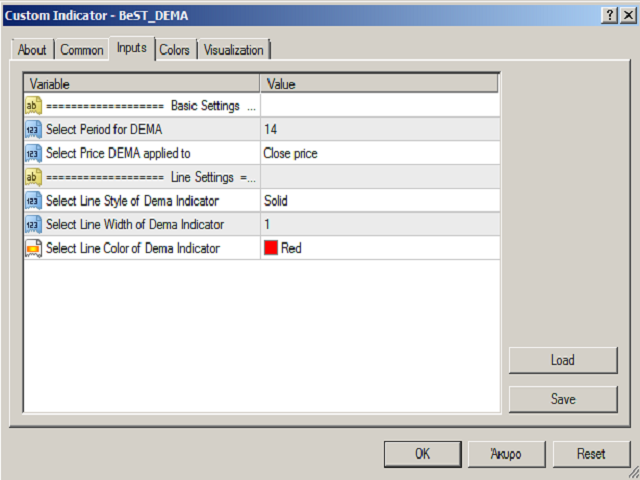 Select Price DEMA applied to: It is the price we use in DEMA calculation. By default we use the price of Close. Fixed a problem of DemaLineStyle Input in Line Settings. The new features are some additional Inputs about Line Settings.